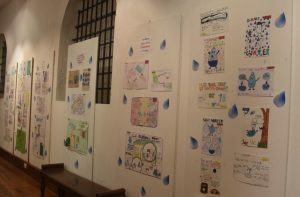 All posters submitted during the recent Water Poster Competition – ‘How do you save water?’ – are now on display in the Gallery at the Museum of St Helena, Jamestown. The posters are on display from today, Monday 27 March 2017, until Sunday, 2 April 2017 (see photo attached). Members of the public are encouraged to view the display which showcases the creative talent of the young people on St Helena.